Asia Cup Squad: Overall positive but why Nasir and no Shehzad? When Mohammad Ilyas announced his resignation following the just concluded series between Pakistan and England, I was a content man. Totally satisfied. Not because Mohammad Ilyas was not going to be part of the PCB selection committee going forward, but because his resignation signalled the end of Imran Farhat's career. It is no secret that Farhat's inclusion in Pakistan's squads has been due to dear daddy in law. And with no daddy in law selecting the team now, Farhat was bound to be dropped. And that was made official moments ago when Pakistan's new chief selector, Iqbal Qasim, announced Pakistan's squad for the upcoming Asia Cup. It was double satisfaction for the Pakistan cricket fans as not only Imran Farhat, but even Shoaib Malik, was axed. No Imran Farhat. No Shoaib Malik. God I must be dreaming! When was the last time a Pakistan squad was picked without either of these two? But Good riddance. And finally! I wouldn't lie, I was expecting this, but I had to see the list of 15 twice to ensure that I was not being deceived. With both these parchis out of the team, Nasir Jamshed making his comeback, and Adnan Akmal making way for Sarfraz Ahmed for the wicketkeeping duties, I believe Iqbal Qasim and Co. have done a good first job. All positive changes I believe. Sarfraz should have always been behind the stumps for the ODIs and I still don't know why he was dropped for the England series when he had a decent outing against the Sri Lankans in December. Adnan is good for the tests no doubt, but for the ODIs, a more aggressive Sarfraz definitely makes more sense. I don't mind the inclusion of Nasir Jamshed (anyone but Farhat really) considering he provides aggressive starts at the top of the innings. But I do wonder what the criteria was for his selection. Considering that the Asia Cup will be played in Bangladesh, the selectors might have given some weight to the performances of the Pakistani players that took part in the recently concluded Bangladesh Premier League. But then if that was the case, there were three Pakistani openers that did better than Nasir Jamshed did in the BPL. I will never advocate the inclusion of Kamran Akmal in any Pakistan team. Imran Nazir might be good enough to still play T20s for Pakistan, but I feel he's too unreliable for ODIs. But Ahmed Shehzad is Pakistan's future, and I don't understand how he can continued to be ignored. His performance in the BPL speaks for itself. Well alright, maybe the BPL performance is not enough evidence, but someone please tell me what he did wrong to get dropped from the team in the first place. I heard of some disciplinary issues. So are you telling me that there is no one in the Pakistan team management that can discipline this 20 year old kid? Seriously? The National One Day Championship in Pakistan hasn't happened yet this season, but one can always compare Nasir and Shehzad's performances in the domestic T20 and first class games. 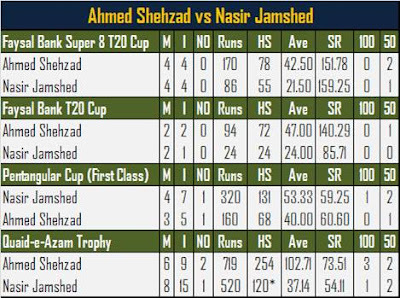 During the current 2011-12 domestic season, Ahmed Shehzad has outperformed Nasir Jamshed in every competition, besides the Pentangular Cup. If you include the BPL among these, then one can see that Shehzad has done better than Nasir in four domestic tournaments out of five. Then what made the selectors go for Nasir and not Shehzad? It is not that Nasir has done badly. He has had a decent season domestically and he is a proven performer at the domestic level. His BPL stint also showed that he is in good form. It is just that Shehzad has done better. Why he remains on the sidelines, is anyone's guess.